This post comes care of Lindsey Rakers, one of the children’s librarians at the Duxbury (MA) Free Library, who did one of the kindest, most surprising things ever. 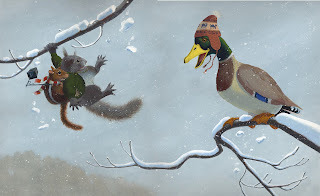 instrumental in my figuring out his distinctive, squawking voice (“Slippery, innit?” he asked)—before I’d sketched the hat in one of my character studies, he was just a duck. Seeing something that I had drawn and painted numerous times, stitch by stitch—in real life—was kind of overwhelming. 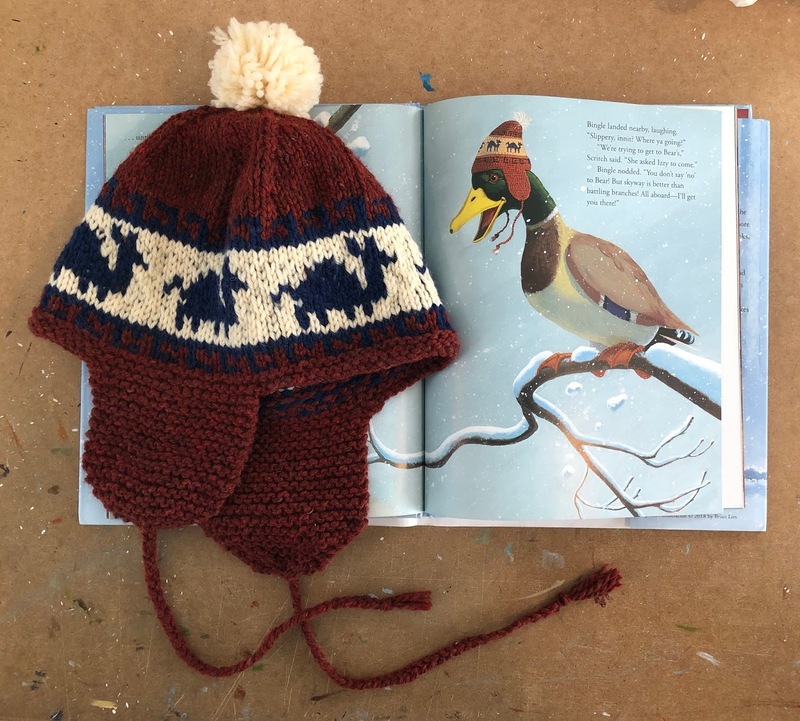 Lindsey also generously offered to share the pattern for the hat, so any knitter can make a replica. I have to say that this reads like a secret code to me. My grandmother was a knitter, so I'd seen it done before, but it still remains kind of a mystery, a sort of magic. Lindsey Rakers: Has there ever been a picture book that so accurately captures hand knit clothing like Got to Get to Bear’s!? I’d be hard pressed to come up with one. After reading the book I just knew I had to try one of these awesome pieces and Bingle’s hat seemed the perfect choice! I dove into my stash for appropriate yarn and researched the heck out of earflap hats before finding the Snowflake Stranded Hats by Premier Yarns Design Team. Their original pattern is available for free on their website. I made minor adjustments to the pattern to make it a bit larger and to accommodate a taller color work panel. Depending on who you are making it for you might want to stick to the original pattern and just substitute in my chart for the snowflake. Check out Got to Get to Bear’s! here or at your local bookstore! Sadly, I used random unmarked stash yarn for this project so I am unable to recommend exact yarns and colors. HAT Right Earflap With MC and smaller ndls, cast on 7 sts. Row 2 (Inc row): K1, m1, knit to last st, m1, k1 – 9 sts. Row 3: Knit. Rep Rows 2 & 3, 5 more times – 19 sts. Work even in garter st (knit every row) until Earflap meas 4”, ending with WS row. Break yarn, place sts on holder. Left Earflap Work as for Right Earflap. Do not break yarn. Hat Body Joining Rnd: K19 sts across Left Earflap, cast on 33 sts for Front of Hat, k19 from Right Earflap, cast on 25 sts for Back of Hat – 96 sts. PM and join to work in the rnd. [Purl 1 rnd, knit 1 rnd] 2 times. Establish Pattern Set-up rnd: * K16, pm; rep from * to end. Switch to larger ndls. Rnd 1: Work Row 1 of Bingle Chart to end – patt will be repeated 6 times across rnd. Cont in patt through Row 20 of Chart, changing colors as indicated in chart. Remove markers. Switch to smaller ndls. Shape Crown Set-up rnd: * K12, pm; rep from * to end. 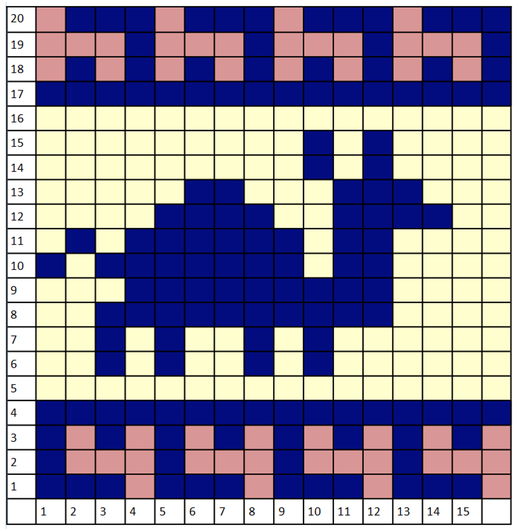 Dec rnd: * Knit to 2 sts before m, k2tog; rep from * to end – 8 sts dec’d, 88 sts rem. Rep these 2 rnds, 2 more times – 64 sts rem. Rep Dec rnd every rnd, 7 times – 8 sts rem. Break yarn, pass through remaining live sts. Ties Cut 3 pieces of CC, 32” long. Cut 9 pieces of MC, 32” long. Holding pieces together as one, attach to bottom of Earflap. Separate pieces into 3 groups each of 2 CC strands and 6 MC strands and braid together. Tie ends in a knot, trim to even ends. Make a Pom-pom using Clover Pom-Pom maker. Sew to top of hat. Weave in ends. BL: Thank you, Lindsey, for sharing this pattern, and—once again—for such an extraordinary gift! 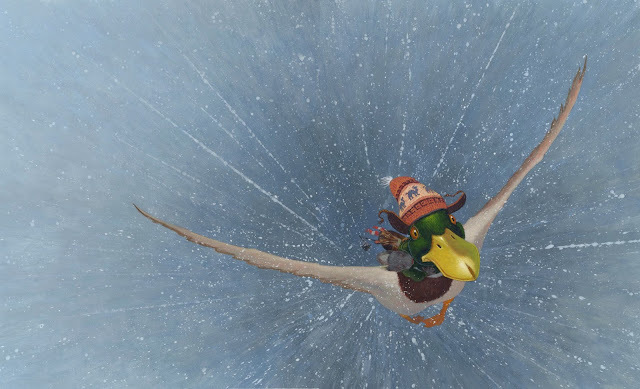 Here’s the hat up close, and Bingle as he appears in the book. Something about the "teens," the pre-World War I era from around 1910-1917, has always drawn me— America in apparent innocence, before two world upheavals. Of course, that "idyllic America" was only idyllic for a segment of the population. There was plenty of darkness to go around. Characters are coming to me from this era, and I'm not sure where they're going. There may be a book in this— I'm just free-spinning, listening to their voices as I draw. This one above started out sweet, and grew wistful as she came onto the page. Though I come from a line of teachers and I see teaching as one of the highest professions, in that era there were only a few career opportunities open to women—most likely secretary, nurse, or teacher. I started to think that perhaps this wasn't her life's aspiration. A group of new characters is starting to talk to me, and it's time to get them on paper. These all seem like critters from the 1910-1920 timeframe. 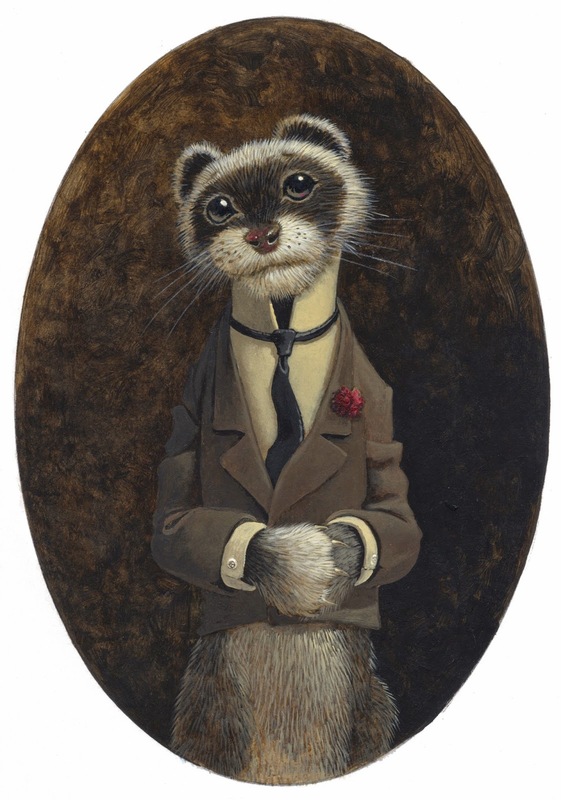 This guy is an all-American type, the passionate and perhaps a little theatrical country preacher. I think he speaks with GREAT inFLECtion, and ain't nobody gonna nod off in the pews while he's getting going. Recently, I've been filling in gaps in my reading, looking at books that I neglected over the years. I just found a paperback copy of Marguerite Henry's Newbery Honor-winning MISTY OF CHINCOTEAGUE at the "book shack" at our town's sanitation facility (AKA dump). I'd never read it because I'd dismissed it. In a snarky, boyhood way, I had classified it as a "girl book," as in "I LOVE HORSES!!!!" (surrounded by lots of scented-marker hearts). I couldn't have been more wrong, in a variety of ways. It wasn't at all what I'd thought. Perhaps part of my problem was that it has always been a "big name" book, and growing up, I knew of it as merely "a horse book." So I automatically assumed it was one of those horse books that I saw girls in my classes holding. BLACK BEAUTY. MY FRIEND FLICKA. THE BLACK STALLION. I didn't see other boys carrying those books around. I'm including a piece on Misty of Chincoteague in this blog about characters because I was so surprised by what I found. Misty, herself, is a surprisingly small character in the book. She doesn't even appear until a third of the way through the story. I'd always assumed it was all drippy, horse-love-y adulation about Misty, from page one. Misty, Misty, MISTY!!! But in reality, it's primarily about Paul and Maureen Beebe, the Chincoteague Island kids who love horses and who craft a plan to earn enough money to purchase Phantom, a wild horse they're sure they'll be able to capture during the annual Pony Penning Day on Assateague Island. Misty comes into the story unexpectedly during the roundup of wild horses, as Paul chases Phantom through the underbrush, and discovers that Phantom has a foal. 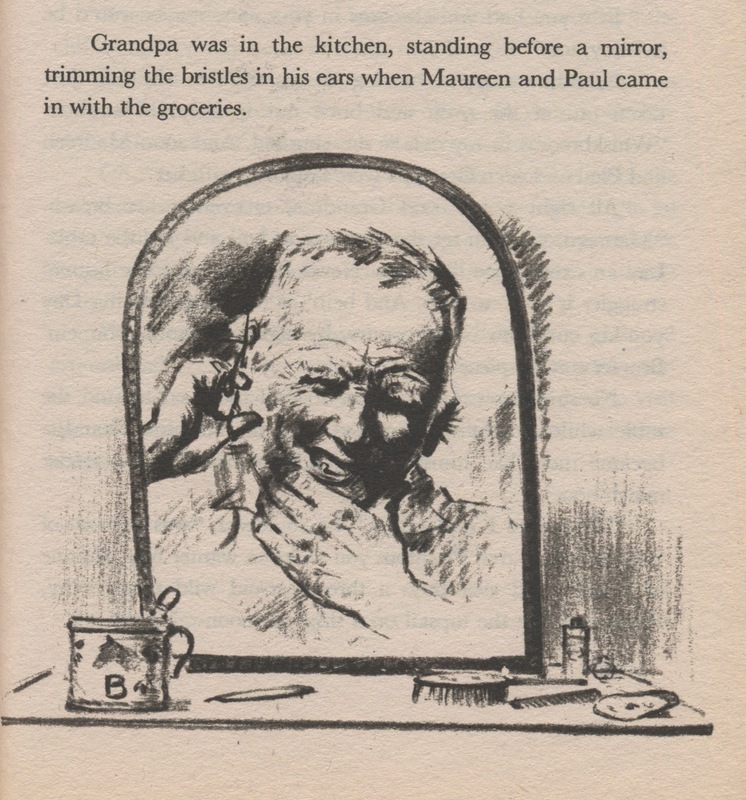 Grandpa's ear hair fixation is a little upsetting. I was also surprised that Paul is such a large character in the book—dare I say he's the main character? His sister Maureen, to me, felt secondary to Paul. Again, I write this always believing that Misty was a "girl book"—girl finds horse, girl loves horse, horse loves girl. Life is good. Yet this isn't what I found in the story. In fact, most of the main characters are male. Paul seems to be more present, more vividly drawn than Maureen. 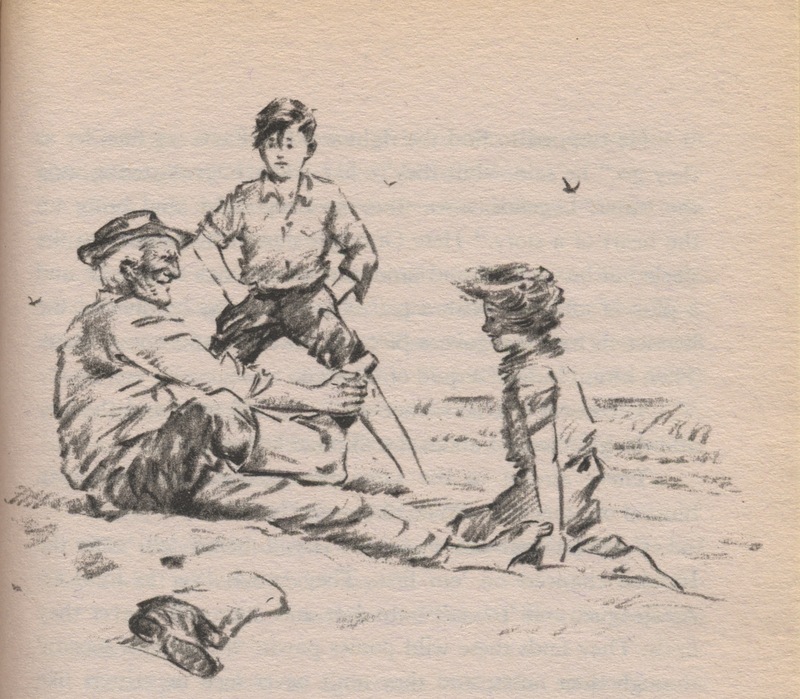 Grandpa seems the second most vivid character, with a distinctively crusty and dialect voice (why don't other characters in the book sound like pirates? ), whose biggest character trait seems to be messing about with his ear hair. He feels much more present than Grandma, who's a loving person, but is far less clearly defined. I haven't read any scholarship on Misty of Chincoteague—was Marguerite Henry's choice to emphasize Paul over Maureen a realistic reflection of actual roles of men and women around horses on Chincoteague, or an inherent sexism of the times (the book was published in 1947)? Who was the original intended audience for the book? Was it assumed that girls would read books with male protagonists, but that boys wouldn't read books with female protagonists (such as The Hundred Dresses, a 1945 Newbery Honor book)? There are numerous subtle reminders of 1940s gender "status" throughout—at one point, Paul vaults over a fence, while Maureen slips through the rails. In the illustration below, Paul stands with feet spread wide, hands on hips, and Maureen kneels on the ground. 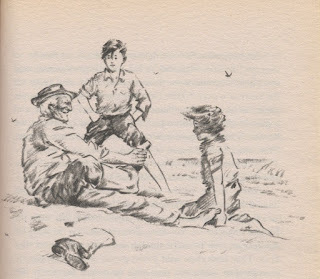 In the illustrations, Maureen is wearing a dress—might a clam-digging, farm-working girl have worn dungarees instead? It may be wrong to apply our current understanding of gender roles to a 1947 book, but I did notice them—possibly because they ran so counter to what I'd expected. But back to Misty. Again, I was surprised at what a small part of the story Misty plays. [Spoiler alert, for that ONE person out there who hasn't already read it!] Misty is a lively and delightful foal, and loves Paul and Maureen and her new life as a domesticated horse. And when Paul releases Phantom to swim back across the water to Assateague Island, Misty stays behind, contented with her life with humans. Is it just me, or do other readers wonder if Phantom is going to be corralled next year by someone less full of heart than Paul and Maureen, and sold off to some horse-breaker? 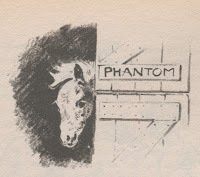 Yet the resolution to the story—Misty stays behind, Phantom gets to return to her wild-natured state—is a happy one, gently foreshadowed for us by Grandpa's reminders that foals are essentially "kicked out" by their mothers, and have to become independent horses on their own. It gave me the simple satisfaction that a certain kind of older fiction provides. I feel like a better person for having read this book, at long last. I only regret that I didn't read it when I was a boy. 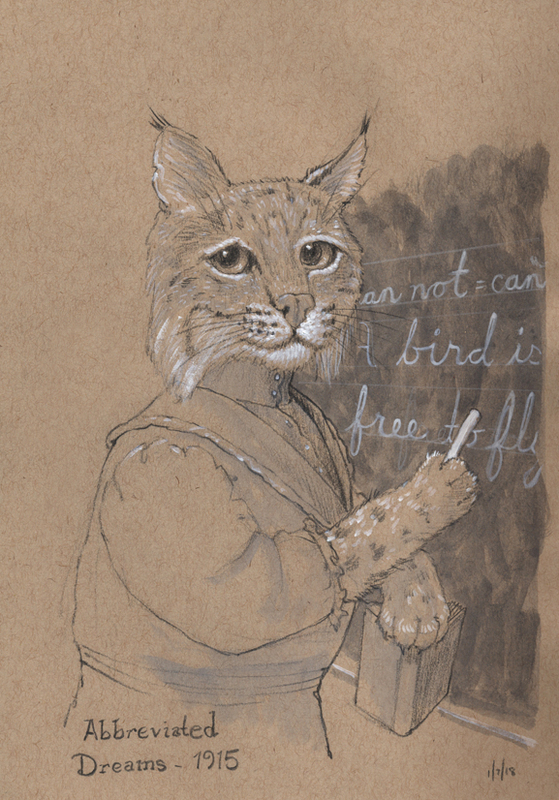 Ferreting out an old sketch. 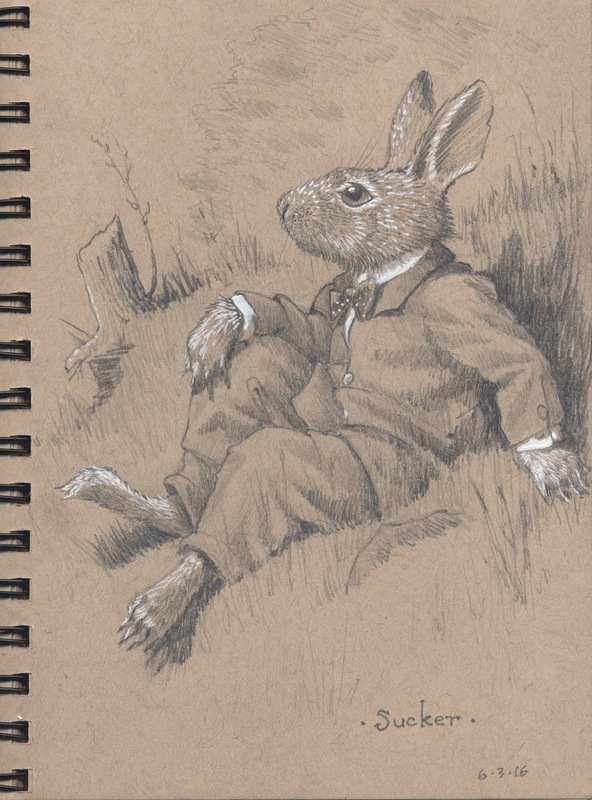 I sketched this guy exactly six months ago today, but never got around to finishing him until now. Here he is. 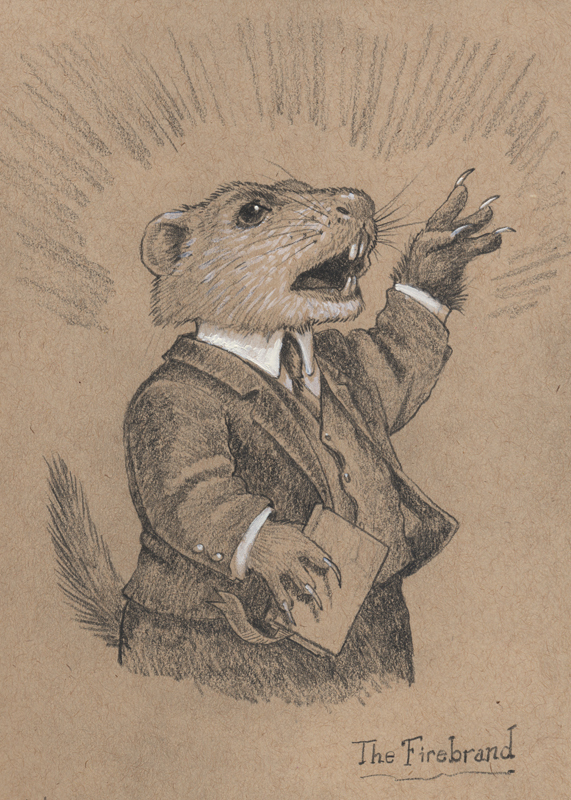 . . and I'm not sure I trust him any more in tonal color than I did in the blue pencil sketch I did on April 17th. I asked about a name for him back then, and my favorite was "Mr. Pole" (which sounds particularly Beatrix Potter to me). Any new ideas for his name, now that he's in color? A lot has happened since April. 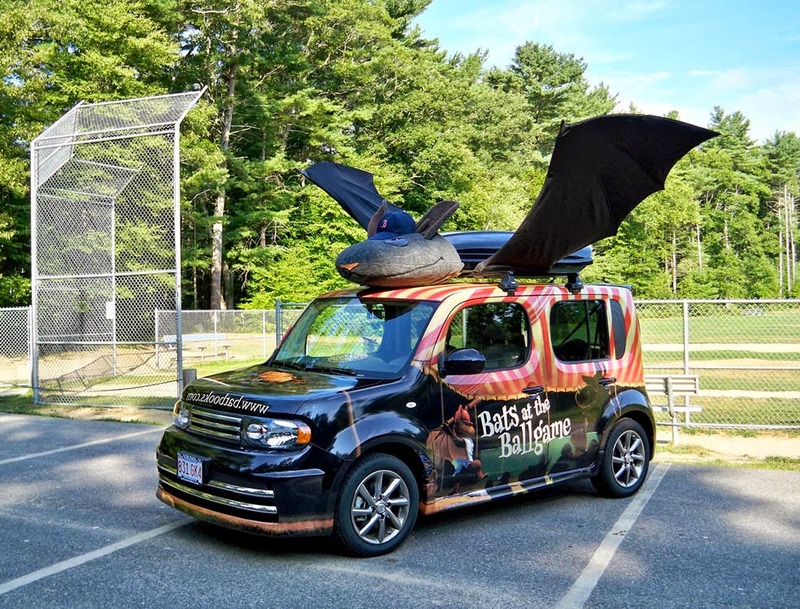 My latest bat book, Bats in the Band, came out August 5th, and if you scroll down on this blog, you'll see my "What I Did With My Summer" essay about creating fiberglass bats to go on our new Batwagon. We've done a lot of events to support the book. We also launched my late father-in-law's new memoir, First Wilderness: My Quest in the Territory of Alaska. (Reminder: if you've seen the PBS documentary about the guy who built a cabin in Alaska with only hand tools—and especially remember his wooden door lock and spoon—you may know Sam Keith's first book, One Man's Wilderness). First off, a warning: this will be a long post. If you want to skip ahead to the photos, that's fine. Since May, I've been gearing up for the release of Bats in the Band, which was published in early August. Prepping our car for the launch involved a tremendous amount of fabrication—carpentry, plumbing, sewing, sculpture and fiberglass work. 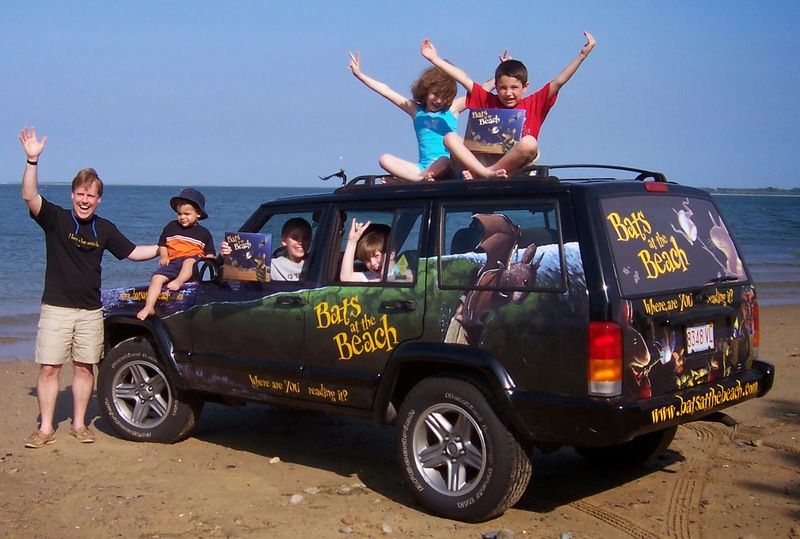 Bats at the Beach: our first BATSmobile, a Jeep Cherokee. Its nice, boxy shape was great for graphics. 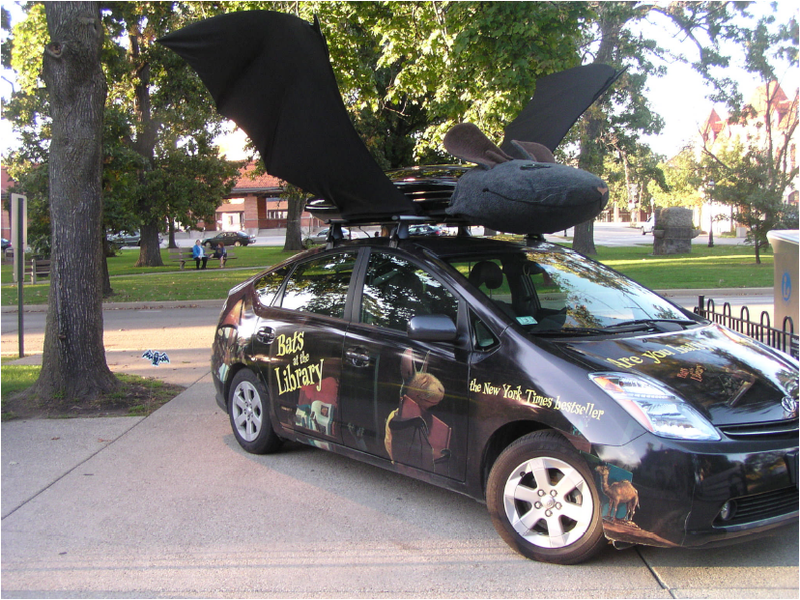 Bats at the Library: A Toyota Prius, small and efficient, and the rooftop bat made up for the car's un-imposing size. Bats at the Ballgame: our Nissan Cube, also great for graphics. 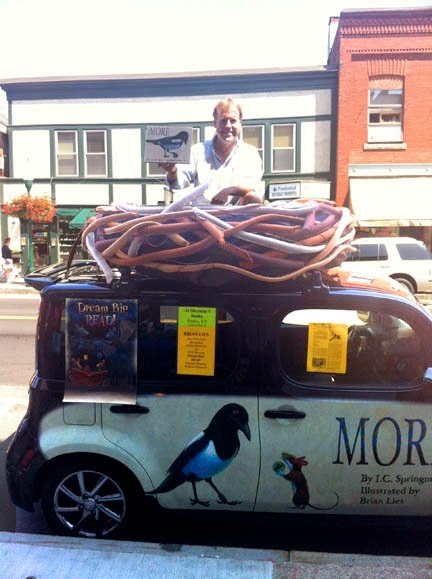 MORE: a bird's nest on top of the Nissan Cube. For Bats in the Band, we needed something musical. We wanted kids at book events to be able to experiment with making sound, with no rules. There would be tuned drums, triangles and other instruments that kids might already be familiar with in music classes, but ones which perhaps they didn't have at home. There's not a lot of time in music class for chaotic, free play, the "what if I do this?" moments that help us find our own ideas, our own groove. But we also wanted the car itself involved. We needed some bats on the roof. But we needed some way of playing the car. Stretched wires you could pluck? The worrier inside me envisioned lacerated fingers. Drums attached to the car's exterior? I didn't want bolt-holes in the finish. Then the answer: Blue Man Group. We've seen them twice—fun art jokes. . . and that PVC pipe organ! What if I built one of those? The worrier kicked in again. 1) It can't hang too far off the side of the car—we'll clip a passer-by, or leave gouges in the sides of a whole line of parked cars. 2) It has to be secure. Nothing can fly off the car at 60 miles per hour. OK, so it has to come apart, somehow. The long pipes, of different lengths, will go in a box on the car roof. The vertical pipes, including the opening you hit, will detach and stow in the car when we drive. Simple, right? Because I was building from scratch, everything was about feasibility. I'd never played, or even seen, a PVC pipe organ up close. Which end of the pipe does the sound come out of? If the horizontal pipes are in a box, will people even hear the sound? Turns out the sound comes from the end you strike, so that's OK. How do turns in the pipe affect the sound? Will it still sound OK? If the pipes come apart in the middle for stowing, does there have to be an airtight connection for the notes to sound? Over the course of two months, and lots of experimentation (can I fabricate my own hinges with skateboard bearings and epoxy? can I build the whole thing so it just unfolds from a box on the rooftop? ), the Batwagon developed. The bat characters were another issue altogether. My first thought was to have an entire animatronic bat band on the roof, perhaps powered by a windshield wiper motor (anyone want to buy one? I have an extra). Problem: they won't stand up to sustained almost-hurricane winds on a car roof when I drive. They have to come off. 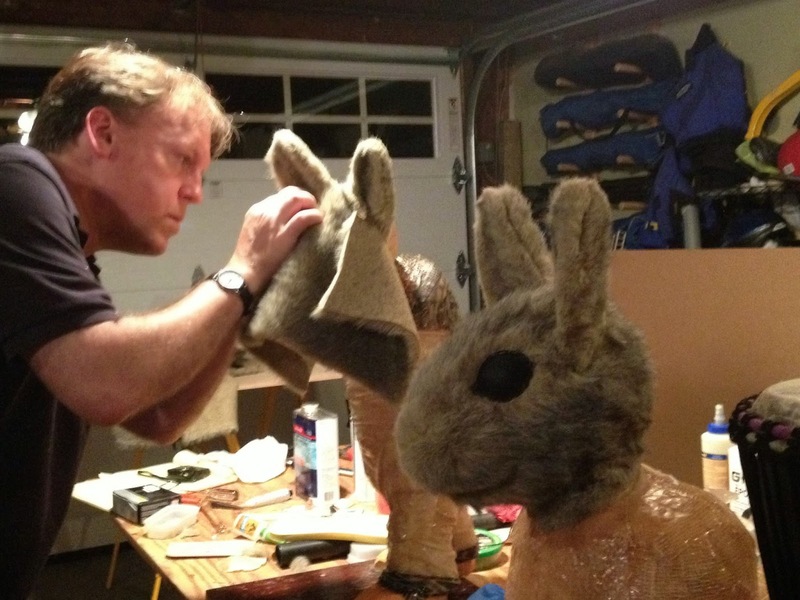 Problem: I haven't built an animatronic figure since high school (maybe that's another blog entry), so how will I do a whole band—in time? The bats became simpler as time pressure grew. Not a whole band, just the conductor from the book, and a guitarist. No motors. Maybe just gimbaled and weighted midriffs, so wind will make them rock back and forth. OK, just solid bodies after all. . . but the wind will move their wings. 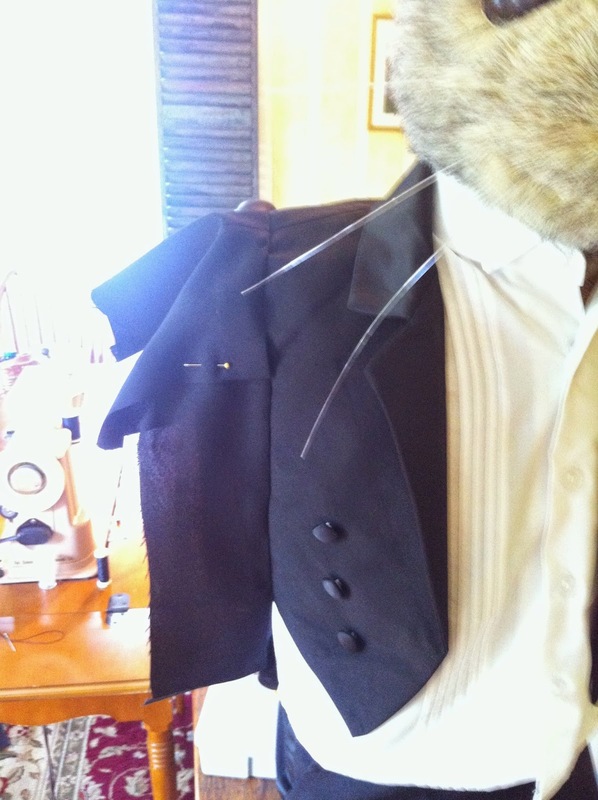 I started work on the conductor bat, and decided to buy a toddler's tuxedo and build the conductor to fit, rather than trying to sew a tux to fit a bat I'd built. That proved to be a great idea that saved me countless hours of tailoring. I started with a form made of a swim-training float and a pair of dowels. I covered the form with bubble wrap to fill out the shape, then with white duct tape, to create a smooth surface. Trying out the tux shirt and jacket. The form seemed to fit well. I didn't want the mess or health concerns of working with fiberglass cloth (dust), so I used drywall mesh tape as the base for the fiberglass resin, which worked OK, but later I learned that strips of old sheet, covered in resin, worked much better. After three or four coats of resin, the form was rigid enough to support the head and wings. The body form with drywall tape. 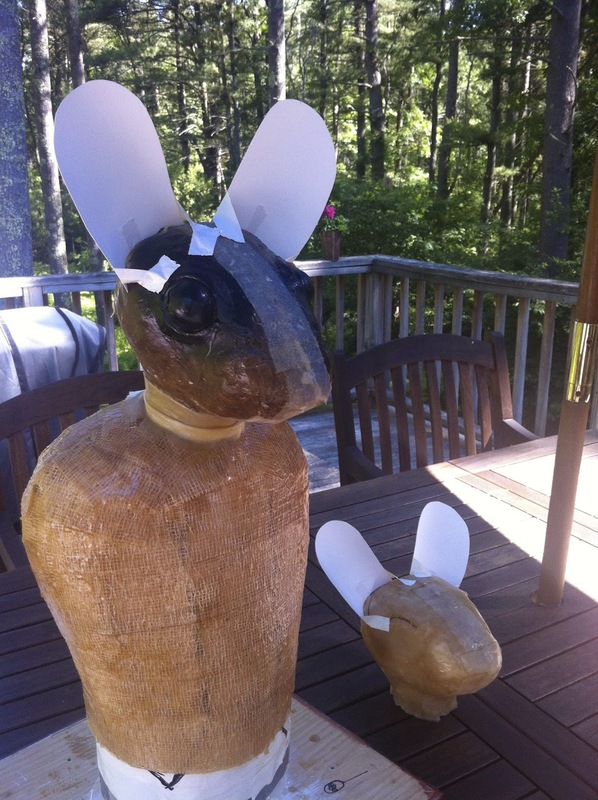 Next, I created two bat heads. I started with a rough wooden form, then added clay to it and sculpted the ratty-looking character head. A halved ping-pong ball, squeezed slightly, made a better smooth eyeball than I could have sculpted. Clay and a halved ping pong ball, paper ears. Metal shims go in to help release the plaster mold. I covered the clay form with Vaseline as a release, then layered on strips of burlap and plaster of Paris. Layers of plaster and burlap create the mold. Two fiberglass resin shells held together. This thing doesn't look like a bat! It looks more like a cicada. I sprayed the eyes with black Krylon paint so they'd shine. 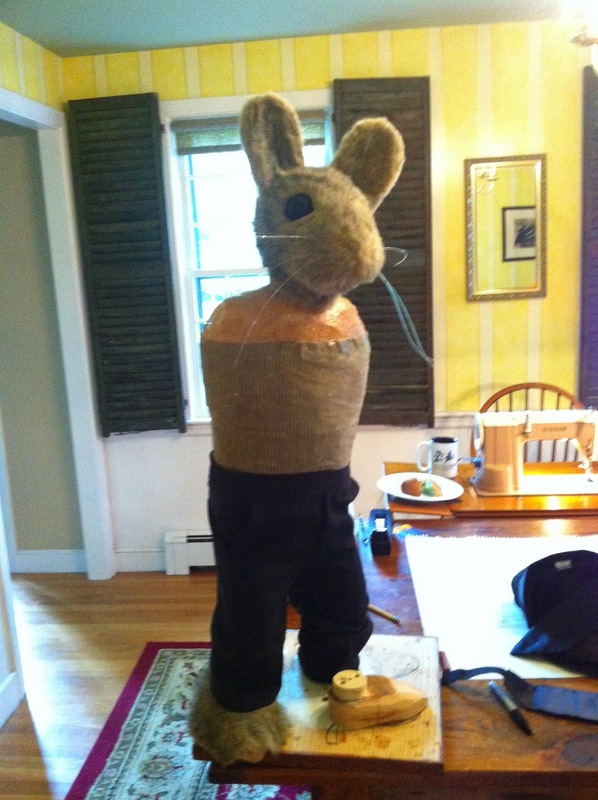 The conductor's head is joined to the body form, and the ears, which will be coated in fiberglass resin, are attached. 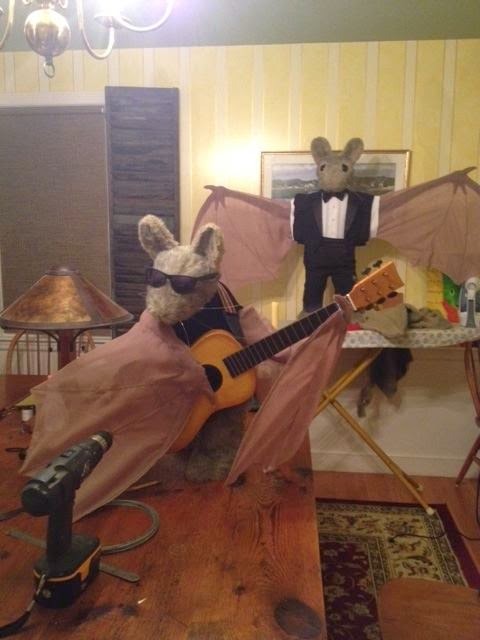 Guitarist bat's head is on the table. Close-up of same. Looks more like a rat than a bat! At work on the ears. Time for fur! Craft fur, left over from some old project, gets Super-Glued onto the front of the ears, folded around back, and trimmed. Now I stretched and glued a single piece of craft fur over the face, cutting darts and trimming the fur as I went along. This was really stressful because I didn't know whether I'd cut a large enough piece of fake fur to begin with, or whether I'd mis-cut and ruin the whole thing. Working on the guitarist's face. Note late night darkness outside garage windows. Time for the toddler tuxedo! 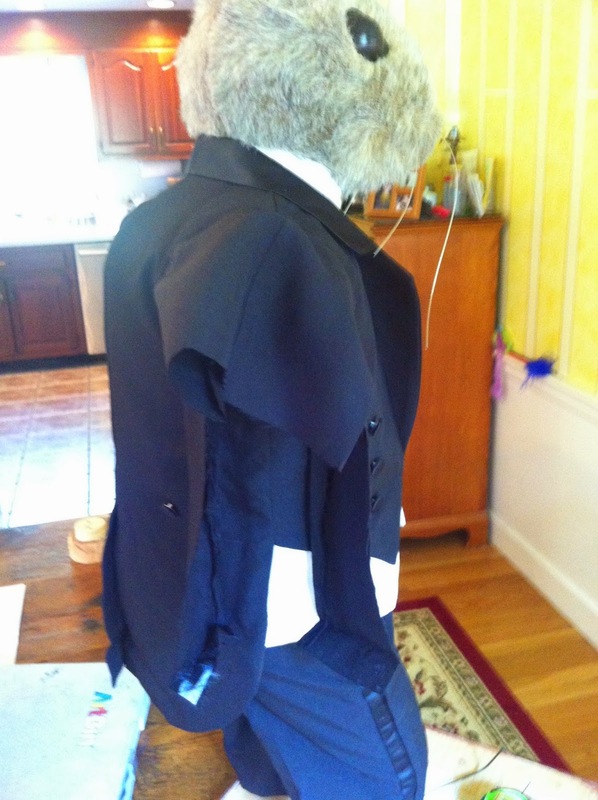 The tailoring challenge was re-working the sleeves so that they opened along their length, not at their ends. Kinda looks like someone's shredded the tux. At moments, I didn't see how it was going to come together. Sewing the wings—opaque cloth for the "bones," and transparent cloth for the wing membrane. The conductor, almost ready for his close-up. When both bats' fur was in place, I neatened it up with a pair of electric clippers. 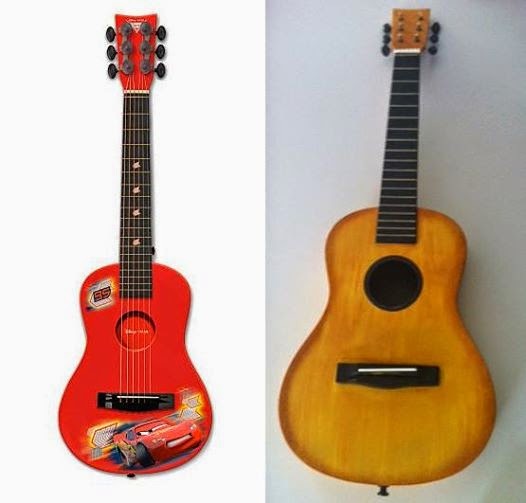 The guitarist needed something to play, and I'd found a plastic Disney Pixar "Cars" guitar at a flea market. I disassembled what I could, masked off various parts, and gave it several coats of Krylon plastic paint. Some hand-painted trim details helped it to look like a real guitar. Back in the garage, I'm finalizing the shoulder attachment mechanism for the conductor bat. Here are the boys in the dining room at 1:30 AM, just a few days before the book launch concert. Finished! 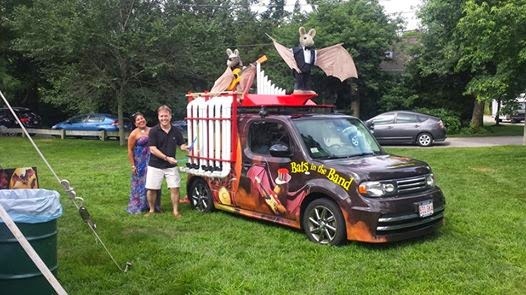 So here's the finished bat wagon, with the PVC pipe organ and the two musician bats on top. Next post: making the PVC pipe organ.